Looking to fill that summertime with some equine fun? We have two spaces remaining for overnight camp the week of June 18th through the 24th and five spaces total remaining for the week of July 10th-14th for both day and overnight camp options for the horse lover in your life. 6:30am: Second Wake Up Call. Time to stop hitting the snooze button. 6:45am: Final Wake Up Call. Buckets of ice water can and will be used! Splash! 10am: Trail Ride It’s what they’ve been waiting for! Time to hit the trails and go exploring. 8pm: Snack Time. Snacks are healthy and balanced to keep our young cowgirls and cowboys in training on the go. 8:30pm: Get Ready for Bed. It’s been a long day. We know they’ll be ready for a good night of shut eye! If children wish to bring a book they may do so. There will be an opportunity for quiet time during afternoon activities from 3-5pm where campers may retire to their bunks, or after they get ready for bed and before lights out is called. 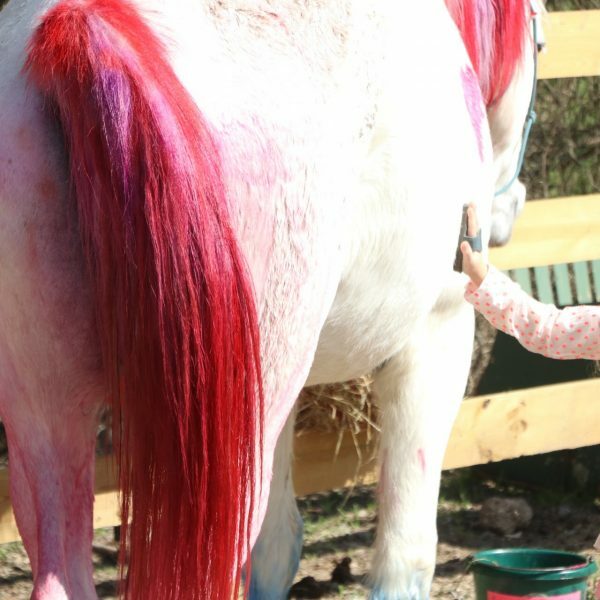 Enjoy painting a horse in our summer camp program! Cowboys and cowgirls are at the heart of culture of this beautiful state we call home. room for horses in our future.